Art by Bilquis Evely from issue 1 of Shaft, © 2014 Dynamite Entertainment. ABOVE: The cover of issue 1. Art by Denys Cowan, Bill Sienkiewicz & Ivan Nunes, © 2014 Dynamite Entertainment. 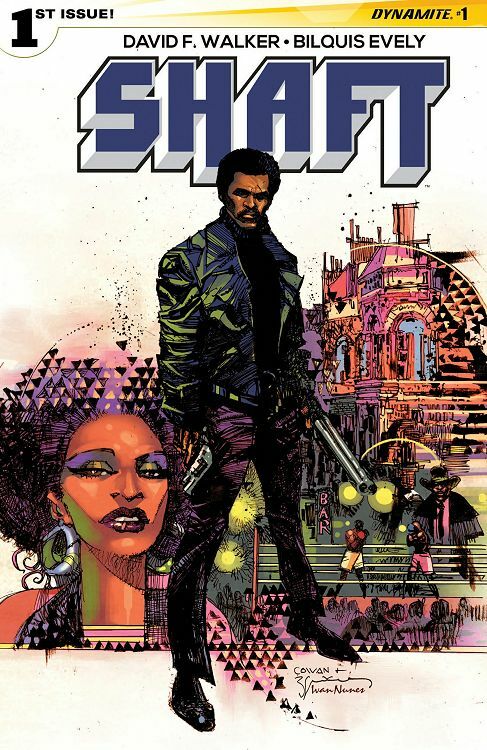 In late 2014 Dynamite Entertainment began publishing a licensed Shaft comic book. Leave your expectations at the door because, for one thing, the comic isn’t set in the same continuity as the movies and TV show — it’s a prequel to the original novels by Ernest Tidyman. And for another thing, it's one of the finest comic books currently being published. Both writing and art are virtuoso performances. It's probably not blaxploitation, either. The comic prioritises depth over attitude. The four issues to date are written and drawn in a realistic style. Walker is the guy behind BadAzz MoFo, a magazine and website about “pop culture at its baddest,” and the Blaxploitation documentary Macked, Hammered, Slaughtered & Shafted. He has a history of commentary on "the African American image in film and popular culture". The comic’s illustrator Bilquis Evely is a young Brazilian artist who uses accomplished oldschool draftsmanship, reminiscent of newspaper adventure strips like Prince Valiant or Flash Gordon. Her comic book credits include Doc Savage.